Tanzania is now in the fifth year of its economic recovery following six years of drought. Food production has grown at 3.5 to 4% over the past three years. The economic growth rate for 1988 seems certain to reach 5%, with inflation on the decrease and some signs of vigorous recovery in industrial output. Over the past four years the Gross Domestic Product (GDP) has grown about one fifth from its low point in 1983, and over one seventh from its recession level in 1978. These figures show the long hard slog that faces Tanzanians on the road back to full recovery. The present pace of growth remains unsatisfactory, with the living standards of almost half of urban households and, perhaps, a third of rural households still only at, or even below, the poverty datum line. Sustained recovery now depends on at least a few more years of reasonable rainfall; increased efficiency in the public and private sectors; a lessening of the defence budget (which has risen because of the military aid being given to Mozambique); and on the terms of foreign trade not changing adversely. Given these conditions it is possible for Tanzania to maintain a growth record of 6 to 8% through to 1991; even so, this would restore per capita income to between 93% and 100% of the 1977 level – the year of Tanzania’s economic collapse due to the quadrupling of oil prices; the beginning of the six year cycle of drought; the cost of the war against Amin’s Uganda; the downturn of world trade prices for the country’s exports, and the increase in the cost of imports; as well as because of some mistaken government policies, especially in the performance of several parastatals. Writing in the next volume of the African Contemporary Record, Prof. R. Herbold Green of the Institute of Development Studies of Sussex University, estimates that the cost of Tanzania’s military assistance to Mozambique was between US$ 125 and US$ 150 million in 1987-88. Two thirds of this expenditure involved direct or indirect imports. The restoration of security across the border would therefore be of considerable benefit to Tanzania’s national budget. Weather and trade terms are ever present threats. However, the last four averagely good harvests have enabled the country to build up a maize reserve of up to 180,000 bags, which is enough to see it through at least one bad season. Prof. Green estimates that external financial gross inflows are probably in excess of between US$ 500 and US$ 900 million. If technical assistance is excluded, the figure is between US$ 650 and US$ 800 million which, he says, is not enough for the country’s needs – especially if there is still no agreement on alleviating the unmanageable external debt-service burden. Exports have not increased as much as was hoped for due to disease of cashew nut trees, falls in coffee prices, a slow turnaround of sisal production and bottlenecks in processing and transporting cotton. But even if these products, which form the old bases of export earnings, are marketed normally, they would still be insufficient to produce the needed lift-up of the total economy. They will need to be supplemented by increased manufacturing, natural gas exploitation and greater gold production. Efficiency increases have been achieved – from grain marketing through operations of the Dar es Salaam harbour to electricity; but there are still sectors of poor services such as water supply for the capital, local transport, agricultural processing and in much of industry. Prof Green cites three reasons why Tanzania’s external balance remains fragile. First, with 1987 imports of goods at US$ 1,092 million and exports at US$ 347 million, only a net transfer receipt in excess of exports is able to keep the gap plugged. Second, exports are not rising rapidly, remaining static over 1986-87, with main commodity proceeds falling over 20% for price and volume reasons, balanced by rises in manufacture, secondary commodities and minerals . Third, the 1987 import level of US$ 1,092 million (only 4% up nominally and down perhaps 6-8% in volume terms on 1986) includes US$ 125-150 million worth of consumer goods and, perhaps, US$ 50-75 million defence-related elements not included in the US$ 1,200 million minimum imports for efficient rehabilitation and operation of the economy so that the shortfall is of the order of 20% Compared to the 1983 situation, however, imports are up over 35% in nominal terms (and perhaps 25% in real terms), and external transfers are up markedly, albeit exports have actually declined (largely for price reasons), falling over US$ 90 million to 1985 before rising to over 1]S$ 60 million thereafter. On a fiscal year basis the trends are slightly more encouraging. The 1986-87 level was US$ 355 million and 1987-88 is estimated at US$ 388 million; but even here main commodity exports showed a fall of US$ 44 million whereas exports of manufactured goods rose US$ 32 million (the whole net gain), and of minerals and secondary commodities by US$44 million. President Mwinyi has been expressing views about architecture which seem to be in some sympathy with those of Prince Charles. He is quoted in the October 13 issue of the Daily News as having said in Zanzibar that architecture should focus on the need for privacy, the desire for beauty and the serenity of a harmonious environment. These human needs, he said, should not be held hostage to fashion or technology. “There is much to learn from the experience of earlier generations, gathered by centuries of trial and error, before we seek to discard this legacy for the often illusory promise of solutions imported from the western world” he told an international seminar organised by the Aga Khan Award for Architecture. Explaining that the pressing demands of a modernising world were straining the continued existence of a historical inter-cultural architecture in Eastern Africa, the President stressed the need to preserve and enhance the indigenous heritage. He commended efforts being made to preserve this heritage, citing the Bahari Beach Hotel buildings and the Mosque at the University of Dar es Salaam. Asukile Kyando of SHIHATA has been interviewing Mr. Sylvanus Mipawa, General Manager of Williamson Diamond Mines about the present state of affairs at the mines. They are situated in Mwadui town in Shinyanga region and were first discovered in 1940. They have the largest Kimberlite pipe in the world with a surface area of 360 acres. 50% or more of the production is gem quality diamonds. Total gross diamond sales between 1958 and 1987 are quoted at Shs 5,309 million. There are about 3,000 workers. The mines recorded their highest production of diamonds in 1966 – 47,000 m carats (a carat is equivalent to 0.2 grams) but in 1987 there were only 124,000 m carats. One of the main reasons for the fall in production is the diminished ore grades. The former and richer deposits have been depleted after 48 years of mining but there still remain some 75.4 m tons of ore reserves at a grade of 5.1 carats per 100 tons. Ore available for mining to the planned 300 ft level is 35.1 m tons with a total of 2,202 m carats of diamonds. “So therefore” Mr. Mipawa said, “we shall keep on hearing about Mwadui mines for a very long time to come – we are certainly talking of a lifespan of at least ten years – provided that steps are taken to rehabilitate the plant and machinery”. The colonial army – the Kings African Rifles (KAR) – was both a pan-territorial army and a segment of the British army with allegiance to the Queen and empire. KAR soldiers did not have to serve in their country of origin but could be stationed anywhere in East Africa. At the time of independence there were two battalions of the KAR – the 6th in Dar es Salaam and the 2nd in Tabora. The total strength was around 1,500 soldiers. At independence, the new government of Tanganyika took over the two battalions and renamed them the Tanganyika Rifles (TR). An arrangement was made for the soldiers who had been recruited in Kenya and Uganda to return gradually to their respective countries while those from Tanganyika who were serving outside could equally do the same. But apart from the change of name and the moving out of non-Tanganyikan soldiers, the military establishment remained the same both in its composition and its ideology. The so-called martial tribes (in particular the Wahehe and Watende (Wakuria)) constituted the bulk of the soldiers while the command structure remained British. The 29 British officers, under a British Brigadier, were retained in the army and given the task of training the locals until such time as they were able to manage their own affairs. But if the past was to be taken as the British pattern of promotion then it was going to take many years before the command structure would be completely nationalised. This structure of command, dominated by white officers imbued with their racial superiority and looking down upon the African officers and the rank and file and the dim prospects for change, despite the changed political situation, was to become a source of tension and the major contributor to the military mutiny in 1964. In the end the native rank and file thought that they had no alternative but to resort to mutiny to air their grievances. The grievances were basically two. The soldiers wanted British officers removed and they wanted an increase in pay and the restoration of certain fringe benefits. The mutiny was organised by a handful of local rank and file. Initially it was only the battalion stationed in Dar es Salaam that was involved. They were poorly trained and armed and yet they managed to put a whole government machinery to a standstill from January 20th to 25th 1964. This was possible despite the good organisational set-up of TANU throughout the country. For five days neither the Party nor the government machinery managed to organise any local resistance. On the other hand, the suppression of the mutiny required only a handful of British marines. Hence we find that by January 1964 Tanganyika, like most other independent African countries, had a military that was too small for the defence of the territorial boundaries and unreliable for national reconstruction. After the mutiny all private soldiers were dismissed and sent to their home villages. Their place had to be taken by recruitment of fresh youth. In designing the new army the government and the Party took into consideration three factors. In the first place, while immediately after independence the government and Party had tried to find ways of accommodating different sectoral interests such as those of the trade unions and the civil service, the same was not done for the military. The military did not identify itself with TANU policies, nor did the leaders of TANU have any contacts with the military. The military was taken as an apolitical institution. Secondly was the fact that most of the nationalist leaders who had struggled for independence saw high government posts which were to be vacated by the colonial administrators as the quickest means of amassing wealth and leading a comfortable life. In this struggle for sharing the ‘National Cake’ the military was ignored and left out. A third factor was the obvious weakness of the political system demonstrated by the mutiny and its later suppression. In designing the new army the military was no longer to be taken for granted. Its place in the political set-up had to be well defined so that it identified with the policies of the Party and the government. The period between 1964 and 1967 was crucial in defining the role that the military would play in Tanzania. It was in 1964 that the first shots were fired by FRELIMO to mark the launching of the guerrilla war against Portuguese colonialism in Mozambique. Tanzania was to become the rear base for this protracted war. The OAU had also selected Dar es Salaam as the Headquarters of the Organisation for African Unity’s Liberation Committee which was covering all the other liberation movements in Africa as well. To the political leadership in Tanzania, this position that the country was taking up had to be backed up by a stronger military than two battalions of the TR. It was also during the period of 1964-67 that the country had to demonstrate its non-alignment. Unlike the time when all weapons systems had come from NATO the army started to acquire arms from the Eastern block and especially from China. The Canadians were called in in 1966 to train in administration while the Chinese came for tactics in 1967. After 1964 the Tanzania Peoples Defence Force (TPDF) as it was now known had three infantry battalions – in Dar es Salaam, Tabora and Nachingwea. The air transport battalion was started in 1964, the tank and armour battalion in 1965 and a navy unit in 1967. Concrete measures had to be taken to involve a greater part of the population in defence matters. In 1966 a National Service Act was introduced. This required all youths finishing high school or doing any advanced training after Form IV to join the National Service. Idi Amin’s coup in Uganda made it crucial for the political leadership to secure army loyalty in Tanzania. Previous to this there had been the abortive invasion of Guinea by Portuguese forces because of that country’s support for the liberation movement in neighbouring Guinea Bissau. There was fear that something similar would happen in Tanzania because of its support for FRELIMO in Mozambique. The suppression of the attack on Guinea by a citizen militia led the Party to call for a similar type of military preparedness in Tanzania. Serious involvement of the masses in military preparedness came about therefore after the Party Guidelines (MWONGOZO) were issued in 1971. TPDF instructors were sent to every district and work place throughout the country to provide military training. Militia training is done in the evening after the normal working hours and it takes up to four months to complete the course. Recruitment of the militia is done by the Party at branch level. After training, personnel become part of the reserve army but its command is directly under the Party and not the military. The use of the militia during peace time is to perform police and security duties. Next followed changes in the composition of the regular army. From 1976 a TPDF Bill was passed in Parliament to the effect that only officers, non-commissioned officers and technical personnel would be employed by the army on a permanent basis. The rest of the rank and file would join the army on a contract basis after which they would go home to form part of the reserve army, while fresh recruits were taken from the National Service. This policy of involving the masses proved its worth during the 1978-79 war between Tanzania and Uganda. Every level of the Party had to mobilise for the front or rear defence work. In this way it proved possible, within two months, to raise an army of 50,000 men that finally brought down the Idi Amin government in April 1979. After the war demobilisation was done by the Party in the same way. Some of the militia were returned home (this exercise took only one month); the bulk of the militia remained in uniform and constituted part of the now much larger TPDF. After the mutiny Mwalimu Julius Nyerere called on TANU youths to volunteer for army service. Selection was undertaken by Party branches on the basis of commitment to and identification with the Party and its policies. This process produced 500 new recruits. But this number was not enough for the new army. Hence there was a selective recall of former members of the TR. As long as they had not been directly involved in the masterminding of the mutiny they could be recalled. By this process most of the former TR soldiers were taken back. However, they had to become TANU members. In this way we find that since its formation in 1964 the TPDF was made up of soldiers who identified themselves with the ruling Party. The soldiers not only undertook professional training but were also subjected to political education. This education emphasised the history of the nationalist struggle for independence and the goals of the Party and political leadership in creating a unified nation. Under the Arusha Declaration the role of the army was defined as that of being a vanguard for the building of socialism and as a college for defence and socialism. After the 1971 Party Guidelines there was instituted a system of Political Education Officers most of whom had graduated from the Party Ideological College in Kivukoni. It was their responsibility to raise the level of political consciousness of the soldiers at each level. Around 20% of training time is allocated to this. The army was organised on the basis of ‘democratic centralism’. Thus the control of the army by the Party organ is found at the national level. But below this level the Party operates as two parallel organs in the army and outside. The major difference is that, while in the civilian organisation of the Party the chairmen of the various organs are elected and do not have government executive powers, in the case of the army, the chairmen of the various organs are not elected and hold their positions by virtue of their executive powers in the Command structure. For example, the moment one is appointed a battalion commander one automatically becomes the chairman of the Party branch in the battalion. Similarly, one cannot become a branch chairman in the army if one is not first appointed battalion commander. Whoever is appointed the Political Commissar of a formation in the army automatically becomes the secretary of the Party at that level. Apart from these two posts of chairman and secretary all other committee members in the army are elected according to the Party constitution and procedures. In Party meetings an atmosphere is created whereby the ordinary soldier can ask about and criticise Party policies and their implementation. But the success of the meetings depends very much on the ideological clarity of the chairman and his secretary in creating an atmosphere of free discussion, given the strong command powers they possess. The Daily News reports that Tanzania’s Ministry of Education has appointed a 14 man task force ‘that will be responsible for the setting up of an Open University.’ The Chairman is the former Vice-Chancellor of the University of Dar es Salaam, Mr. Nicholas Kuhanga. 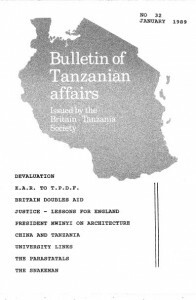 Sir Geoffrey Howe visiting Dar es Salaam in September 1988 announced that British project aid would be increased to £18.0 million in the 1988/89 year, a 50% rise on the previous year. Sir Geoffrey also handed over 15 new trucks (part of a consignment of 30) for use by the Cooperative Unions in the Western cotton growing areas. Zanzibar Chief Minister Dr. Omar Ali Juma has said that his government will not resort to repressive measures to deal with a clique of critics as long as actions by these adversaries do not develop into conspiracy or sedition against the state. “The government has no intention of enacting a detention law or embark on mass arrests of dissidents because this will abort the democratisation process” he said. A fungal mildew disease of cashew nuts, known as Powdery Mildew is considered by the Ministry of Agriculture to be the main cause of the drastic reduction in cashewnut production in Tanzania from 145,000 tons in 1974 to 22,000 tons last year. Now, in a project jointly financed by the government and the World Bank, a serious attempt is being made to check the disease. Dr. A.B. Shresta, an agronomist with the FAO has said that trials carried out in 1986 and 1987 showed that, where crops were sprayed with sulphur compounds, increases in yields of between twenty five and eighty per cent had been achieved. Tanzania’s Education for Self-Reliance Policy together with Universal Primary Education (UPE), both of which caught the world’s attention as the country’s proudest achievements in fighting ignorance still do not have very much to show in achievement. The present crisis of primary school leavers, as exemplified by the flooding of urban areas with an influx of young semi-literates who cannot get a place in secondary school or fit into rural life in their villages, appears to be both confusing and compounding. It is confusing because the introduction of self-reliance was meant to adapt pupils to the realities of a country in which 95% of the population lives in a rural environment. The education reform was also meant to be a means of slowing the rural exodus into the cities, thus lowering the unemployment rate and preparing the youth for appropriate roles in society and working towards better living. But twenty years later the migration of youths from the villages to urban centres has increased; so has the youth’s disillusionment as they confront the growing appreciation that urban streets are not paved with gold. And along with this disillusionment the young people question and disregard the relevance of mainstream social values, leading sociologists to fear that the costs of this attitude to individuals and the nation may be monumental. What worries them is the number of those growing up with a limited and hostile sense of life. For many, they say, the future is tightly hemmed in by horizons so narrow that moving out of poverty seems unthinkable. With no capital to make a living in their villages most of these youths, some as young as fourteen, drift to urban areas where, finding no reliable source of income, they soon drift into alcoholism, drug abuse, burglary, armed robbery, stowing-away and other unbecoming behaviour like prostitution. But in a country where education has long been considered to be one of the basic social needs and accorded a high status, the situation raises some controversial questions. Officials blame the young people who enjoy the benefits of a free education and go on to spurn facilities which society places at their disposal. But critics think society itself is to blame as these young men and women are merely victims of circumstances and forces they cannot control. As soon as they come out of school a stark, colourless life without any support is what greets them in the poor villages. Squeezed between poverty and indifference the urban streets look like the only outlet to them. Critics of the existing education system say the problem has been caused by ignoring actual facts in overall education planning, notably the economic structure of the country and its growth trends which limit and overestimate employment opportunities. August 28th 1988 was Census Day in Tanzania. After months of preparation some 50,000 enumerators began updating the statistics on Tanzania’s population. The last census was in 1978 and estimated Tanzania’s population at 17,512,610. Assuming a growth rate of 3.2% p.a. the population is now estimated at 23,997,000. Apart from the general population census certain sections of the community were asked to provide more detailed information. Do you speak Swahili? What is the highest formal education you have received? Do you have water, electricity in your house? were among the 32 questions asked of this sample. Many people complained that they had not been counted on Census Day. Miss Lucy Lameck, the National Census Commissar, explained that there had been problems because of rain in certain areas, shortage of forms, changes in maps and failure of some enumerators to turn up. Miss Lameck was confident however that everybody would have been counted during the following few days.